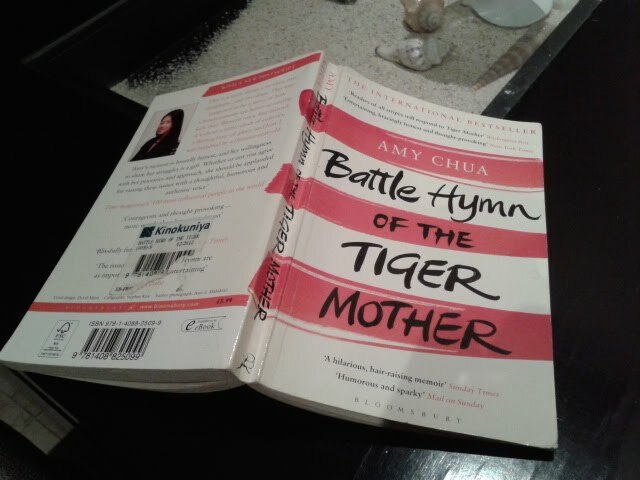 Being Indian I did not find the book 'Battle Hymn of the Tiger Mother' appalling at all. Funny? Yes. Entertaining? Yes. Thought provoking? Yes. Not put down able? Yes! This witty satire was one of the most sought after books in 2011, and is recommended for both parents who have raised children, as much as children. Amy Chua who is a professor in law at Yale Law School shot to fame with this controversial bifurcation of parenting into two distinct styles, derived from respective cultural influences. She vociferously defended 'her' style, of course, by telling her own tale of raising two girls. The first is the 'western way', wherein parents are relaxed, find the need to have a wholesome life with various hobbies alongside studies. Their children's self esteem is of paramount importance, they aren't pushed into anything & are allowed to make their own life choices. Eg: Mayim Bailik's attachment parenting style, where they don't teach even ABC, colors or counting till the kid is 5 years old. The second way is her way, i.e. the 'chinese way' (/ indian way) wherein parents measure successful parenting by clear tangible results: being academic geniuses & music maestros in the field of violin or the piano. This is an extremely strict and supernagging way, children have to be supremely focused , practice practice practise, absolutely NOTHING must come in the pathway to success & there is NO alternate to not achieving goals. Children obviously don't know what they want in life, and what it takes to make it in life. If they are given a choice, isn't it obvious that they will slack it off, not make use of their intelligence and with all likelihood, become failures. This is how we get to see Chinese stereotypical success stories. Of course this may not always work, which happened with Amy's second born, who by the time she became a teenager, rebelled. And Amy had to loosen her hold, release the pressure. I get that. I've been there. I've had my mom be the no. 1 enemy in my life. I had rebelled. My mom gave up. True story! So of course, when we conceived our little guy, we were all for 'liberal' upbringing. "We are not going to 'force' our kids into anything". But when you're 32 & look back at your childhood, you don't think all that pushing was all that bad. In fact there are things that we were pushed into that we wished we continued with. I had taken up karate, classical dancing, painting, drawing , none of which I continued with. I can't draw a line to save a life today and if I wasn't forced to study, I'd probably be doing something pretty useless by now. But on the other hand, if they would've encouraged me to take up fine arts as a career, who knows what would've become of me. Now when I read Chua's book, the more I feel there needs to be a balance between the two styles. Yes, you need to have fun during vacations but we also need to keep pushing them into what they're good at. You are their guide & mentor after all. Amy's way will suit children who are driven, talented & of at least some intelligence. Even so, it may not become a success story. The student who ranks no 1 in school may not necessarily get the best job at campus if he or she doesn't have the prerequisite leadership, & communication skills. I'm just saying it ain't a fool proof plan. On one level, the child may just alienate you in course of time which will backfire both in the career & relationship department. But on the other hand, if children are left to themselves, they may slacken and waste their lives ahead. All said and done, for a majority of population, teens & early 20's are what solidify the foundation. In the corporate world, you better have landed a decent paying job by 30. A sports persons career is virtually over by the time he's 30 (no Golf doesn't count). If you're a music artist you better have cut a successful album by 20. If you're a model, 30 is when you need to make a transition to another career. Yes, it is changing... 40 is the new 30 & 50 is the new 40. But I believe teenage & early 20s is when you have the maximum momentum - and one must make maximum use of it and after reading this book, I validate this notion of the necessity to give that push. "When you learn to force yourself to practise for an hour or run fifteen laps, you start building self-regulatory strength. A five year old who can follow the ball for ten minutes becomes a sixth grader who can start his homework on time." Having understood that, the only question that remains is: Do "we" as parents have the "drive" to push our son?! As a ABC raised by my own tiger mom I've often debated the benefits of Western vs. Asian parenting. On one hand Chinese/Indian parenting can drive the child to succeed and develop willpower. However, in my experience it can cause a detachment between the child and parents that lasts into adulthood as well as self-esteem issues especially when the child is raised in a Western culture. I also think that tiger parenting in Asian cultures often comes across as a need to "save face" and one-up the other mommies/kids instead of encouraging the child to do their best. Both sides have their pros and cons, but a bit more carrot and a little less hits with the stick and shame would benefit the tiger mommy-ing method. Thanks for your comments here and on my post on breastpumps. Always nice to hear different point of views. & Totally agree with "save face"!